From Baton Saddle, the route follows snow-poles steeply down to the valley floor through Spaniard grass thickets (not the most sensible or obvious route) to the bog at the valley floor. After negotiating the bog, the track moves to the true right and steadily descends through ferny glens to Flanagan's Hut (after a final shallow crossing of the Baton Stream). 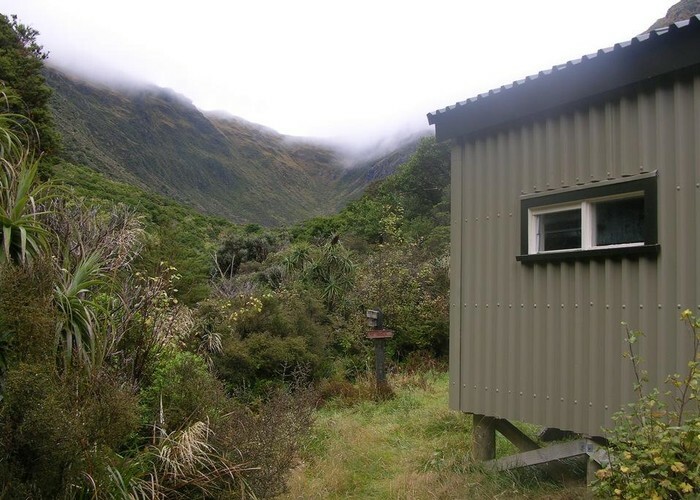 From the hut, on the true left, a wide benched track descends steadily to the first of 5 or more crossings. The track deteriorated in places and sidles around bluffs (wire rope assisting in steep and slippery places). In several places the track edges along the river making the track impassable in times of high water. The track finishes (starts) at a bridge over the river on the true right. From here, it’s a 4km slog along the 4WD track to the ford over the Ellis River that gives access to the 2WD Baton Valley Rd. Baton Saddle from Flanagan’s Hut • By bernieq. Licence: cc by-nc-sa. Added 1 May 2011 by bernieqbernieq. 5 revisions, most recently 24 April 2013 by bernieqbernieq. 266 views in the past year (22 per month).